NEW BRITAIN - The New Britain football teams knows what’s at stake. The 16th-ranked Hurricanes (6-1) also embracing the challenge. For the second time this season, New Britain will play in what amounts to a playoff-type game when it hosts No. 13 East Hartford (6-1) tonight with the chance to show the Hurricanes are as good as their record indicates. At the same time, the Hurricanes certainly have their work cut out for them. The Hornets come in with an explosive offense thanks to a number of playmakers. East Hartford is averaging 38.9 points per game, which did drop a little after the Hornets suffered their first loss of the season last week to Southington - the team that also handed New Britain its only loss this year - 42-27. Against the Blue Knights, East Hartford lost two 14-point leads in the first half and scored just a single touchdown after halftime, despite racking up 427 yards of total offense, meaning the Hurricanes are expecting a team just as motivated as they are. Raquan Tompkins, the Hornets’ quarterback, was responsible for 352 of those yards and three touchdowns. The key cog that makes East Hartford’s offensive unit go, the senior completed 14-of-29 passes for 258 yards last week, while leading his team in rushing after collecting 92 yards on 24 attempts. Then there’s Tompkins’ favorite target in Jaquan Allen. The two have put up some gaudy numbers this season and connected on 7 passes last week with Allen finishing with 157 yards (22.4 yards per catch) and a touchdown, which went for 62 yards. The week before against Enfield, the wideout hauled in 11 catches for 270 yards and four scores. Perhaps a forgotten component of East Hartford’s offense at times is running back David Ortiz, although he was held to just 31 yards on 13 carries by Southington. He’s replaced Kevon Jones, who is now starting at linebacker for UConn and was responsible for doing the most damage against New Britain last season. New Britain, however, is coming off another strong performance on defense after holding Glastonbury to just 125 yards of total offense last week in a 44-10 rout. In the win, the Hurricanes came away with three sacks, forced three fumbles, recovering two, and a safety. 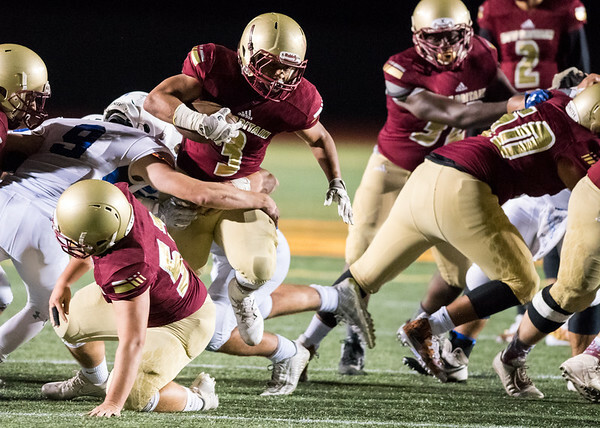 As good as New Britain’s offense, particularly its running game, has been this season, its defense has also continued to play at a high level. The Hurricanes have only give up more than 14 points twice this season - against Manchester (26 points) and Southington (27). And overall, opponents are scoring an average of 12 points against New Britain this season. It’s part of the reason the Hurricanes have outscored teams 118-46 in the first half of games this year and 120-27 in the second. And East Hartford has shown it can be turnover prone. Thompkins tossed four interceptions last week with three coming after halftime. Of course, while the Hornets’ offense has had little trouble scoring points, their defense has had a tendency to give up a few. The fewest points East Hartford has given up this season was seven to a winless South Windsor in the season opener. Since then, opponents haven’t scored less than 16 points, including at least 21 over the past five games. New Britain would certainly like to continue to do what’s made it successful all season on offense and that’s run the football. The Hurricanes stand a good chance to do that again tonight. East Hartford allowed Southington, a team that has struggled at times to get its run game going, to rush for 245 yards with 210 coming from Tanner LaRosa. New Britain’s leading back, Shawn Robinson, has only been held to under 100 yards rushing in two games this season and that’s only because he was held out with some injuries. Against Glastonbury, Robinson ran for 155 yards and two touchdowns, while quarterback Tahje Yopp ran for 104 and three scores. That of course, will be the key, especially in a matchup like tonight. Posted in New Britain Herald, New Britain on Thursday, 1 November 2018 21:21. Updated: Thursday, 1 November 2018 21:23.